The entire affair began with a Project.Mayhem. [16-13] Orthrus cruiser fleet roaming the region. The PM Fleet found a wormhole leading to the area and decided to take advantage of it. The located their first victim in the MK-YNM system in the form of Rorqual industrial capital ship. The ship was swiftly tackled and its escorts destroyed. The Rorqual pilot managed to slow down the attackers destruction by activating its Pulse Activated Nexus Core (Panic). Project.Mayhem. scouts fanned out in search of other prey. A few of those scouts arrived at the 1M7-RK system where a Hel super carrier had been spotted in the past ratting. The scouts were not disappointed as a few moments after entering the Hel itself, belonging to Shadow of xXDEATHXx [X.W.X], warped at range of the gate in an attempt to scare the intruders. This turned out to be a mistake as the Project.Mayhem. interdictors quickly found the ship as it was aligning to a citadel on the grid. One of the interdictors warped to the structure at range and positioned itself in the warp path of the super-carrier. Once in position it deployed a warp disruption probe in order to pull the prey out of warp and out of range of the citadels tether and safety. The Hel pilot did not notice it in time and landed at the edge of the warp disruption probe and quite a distance from the citadel. The interdictors quickly deployed more warp disruption probes, covering the ship and making sure it couldn’t get away. The main fleet having finished destroying the Rorqual was notified of the trapped super-carrier and raced to the system. Upon eaching the system, the fleet quickly warped on top of the Hel and started to apply damage as the massive ship continued navigating towards the citadel in hopes reaching safety..
As the Hel’s shields slowly dropped, a Velator corvette warped in and lit a cynosural beacon. A Shadow of xXDEATHXx Apostle force auxiliary jumped in near the hostiles and lit a secondary beacon. This time nine Nyx super carriers jumped through with a Minokawa force auxiliary in tow. The super carriers deployed fighter squadrons and started targeting the Project.Mayhem. ships. Project.Mayhem. reacted swiftly, targeting the fighter squadrons while calling for reinforcements. Project.Mayhem. pilots and their allies in Snuffed Out [B B C] boarded Tengu strategic cruisers and other supporting ships and raced through to reinforce the fleet, bolstering its numbers to 130 by the fight’s end. The swarm of fighters however was taking its toll. Logistics cruisers and ordinary cruisers were soon felled by the fighter squadrons. Project.Mayhem. pilots attempted to use a perch above the field in order to warp off once targeted by the swarm of fighters but often times couldn’t get away in time or got caught by support fighters such as the dreaded Siren. The entire fleet itself spread out around the super carriers, keeping tackle on them but unable to do much except destroy fighters. The commotion attracted the attention of other entities. Hard Knocks Citizens [HKRAB] had been hunting in the region for quite a while and one of its members spotted the battle. Establishing contact with one of the Orthrus fleet’s fleet commanders, the pilot offered the alliance’s help in combating the super carriers. Project.Mayhem.\Snuffed Out gladly accepted the offer and Hard Knocks Citizens mobilized its renowned Drone Lands super carrier squadron. A scout was sent to the system to inquire the situation of the system’s cynosural jammer while a secondary cynosural beacon secured on the field. The scout found out that Shadow of xXDEATHXx had cycled its cynosural jammer. In laymen terms, the alliance had turned the module off and on, giving it a 30 minute window in which the system was un-jammed. This served the alliance in bringing its super capitals to the field but allowed others to exploit the time window. Yet by the time Hard Knocks Citizens had noticed the fight and organized for its own drop, the cynosural jammer was nearing activation. With the scout reporting only 20 seconds on the clock, Hard Knocks Citizens made a snap decision and had the scout light his own cynosural beacon. The Hard Knocks Citizens super carrier squadron proceeded to jump into the system, landing near the Shadow of xXDEATHXx tower. The squadron aligned towards the P-H5IY gate where the fighting was taking place and warped to its secondary scout which supplied it with a perch. Landing at range of the ensuing melee, the Hard Knocks Citizens super carriers unleashed their own fighter squadrons and started aiding the Project.Mayhem.\Snuffed Out fleet. The combined force of the three alliances was soon able to overcome the hostile super carriers, removing many of their fighter squadrons. With the super carriers’ damage lessened, the force could focus on destroying the two force auxiliaries which constituted the entire Shadow of xXDEATHXx’s logistics capability. The Minokawa went down first, followed by the Hel super carrier as the sub capitals augmented by fighter bombers overwhelmed the ships’ defenses. The super carriers weren’t sitting idle either. Still having a fighters left, the super carriers attempt to inflict more casualties on Project.Mayhem.\Snuffed Out. The fighter swarm descended upon support ships and interdictors, destroying a handful but losing more in process. The amount of fighters left by the super carriers was so pitiful that they resorted to fielding space superiority fighters in an attempt to at least remove some of the fighter bomber pressure exerted by Hard Knocks Citizens. However the sub capital fleet and Hard Knocks Citizens reacted quickly, even removing those from the field. As the turn of the Apostle and the Nyx super carriers came, Shadow of xXDEATHXx realized things had gone terribly wrong and sought to extract what it could from the field. Random sub capitals and even a Chimera carrier came in to try and save the besieged super carriers. The super carriers themselves burned towards the citadel, but the sub capitals had most of them scrambled and webbed, giving them combat timers which meant the ships could not tether or safely log off. Three Nyx super carriers however did manage to reach the safety of the Astrahus citadel and clear their combat timers. Tethered, the ships simply waited the mandatory 30 seconds to safely log off, thus saving themselves. The rest of their brethren were not so lucky. 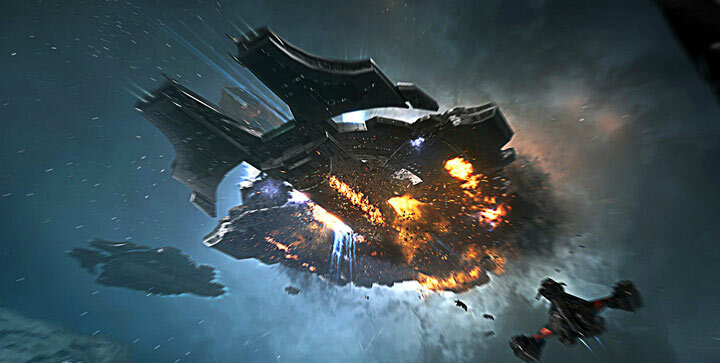 One after the other the Nyx super carriers were destroyed as reinforcements for the attackers kept pouring in. With only three super carriers left on the field, Out of Sight. [OOS] Cerberus heavy assault cruiser fleet arrived at the system. The fleet warped at range of the citadel and joined the fray, aiding Project.Mayhem.\Snuffed Out. Out of Sight. was one of the allies initially called by Project.Mayhem. and made the long trek from Venal to aid the alliance. Once on the field it joined the other fleets in dispatching the remaining hostiles. The joint force obliterated the remaining super carriers as well as any random ships which had warped in to aid them. As the last stragglers were removed, Project.Mayhem. and its allies started looting the field, bringing in haulers. Quickly salvaging what they could the attackers started to disperse, each to its respective staging system. With the attackers extracting without incident, the battle came to a close. Battle report for the 1M7-RK system can be found here. The battle lasted 64 minutes with Time Dilation not reported and the system hosting 200 pilots near the end of hostilities. Project.Mayhem. and Snuffed Out lost the brunt of the attacking ships, 33 including 13 cruisers and 1 strategic cruiser for a total of 9.95 billion ISK damage. Shadow of xXDEATHXx lost 32 ships in the fight, including 7 super carriers, 2 force auxiliaries and 1 combat carrier for a total of 219.96 billion ISK damage. Awesome blog you have here but I was wondering if you knew of any discussion boards that cover the same topics talked about in this article? I’d really like to be a part of group where I can get opinions from other experienced people that share the same interest. If you have any recommendations, please let me know. Thanks a lot! Just got a Blog owner account, it functions good, however how do I locate various individuals blog sites I like with search. I remember there is a means, yet I am not seeing it currently. Thanks for your help. xqbflF This awesome blog is without a doubt cool additionally informative. I have picked up a bunch of handy advices out of it. I ad love to go back again soon. Thanks a bunch! What i do not realize is in truth how you are now not actually much more smartly-liked than you may be right now. You’re so intelligent. You know therefore significantly in terms of this subject, produced me for my part consider it from numerous various angles. Its like women and men don’t seem to be interested unless it is something to do with Woman gaga! Your individual stuffs nice. At all times maintain it up! Hmm it seems like your site ate my first comment (it was extremely long) so I guess I’ll just sum it up what I wrote and say, I’m thoroughly enjoying your blog. I as well am an aspiring blog writer but I’m still new to the whole thing. Do you have any recommendations for first-time blog writers? I’d certainly appreciate it. Hey! I know this is kinda off topic but I was wondering which blog platform are you using for this site? I’m getting sick and tired of WordPress because I’ve had problems with hackers and I’m looking at alternatives for another platform. I would be fantastic if you could point me in the direction of a good platform. Fantastic web site. Plenty of useful info here. I¦m sending it to several friends ans additionally sharing in delicious. And obviously, thanks for your sweat! th1q16 Thanks for the blog post.Much thanks again. Really Great.